A spectacular cake that doesn’t take hours to make and blends sweet and salty flavours. The pretzels creat an authentic twig-like nest that’s easy to fill with chocolate mini eggs or whatever treats you like. In fact why not let the kids help choose the filling? 1. Preheat the oven to 160°C, gas mark 3 and grease a 23cm savarin or Bundt tin thoroughly with butter. 2. Put the flour, caster sugar, brown sugar, cocoa powder and bicarbonate of soda into a large bowl and stir to combine. Whisk the buttermilk into the melted butter and then beat in the eggs. Pour in the coffee and whisk again to combine. 3. Pour the wet mixture into the dry ingredients, whisking until a smooth batter has formed. Scrape the cake mixture into the prepared tin and smooth the top with a spatula. 4. Bake for 50-55 minutes until risen and a skewer inserted comes out clean. Allow to cool for 5 minutes, then immediately invert and turn out onto a wire rack, allowing the cake to cool completely. If you let the cake get too cool before removing the tin, it may get stuck, so be sure to turn it out whilst it is still warm. 5. To make the icing, place the chopped chocolate and butter into a heatproof bowl and melt together until smooth over a pan of simmering water or in the microwave. Stir in the cream and allow to cool briefly before using to decorate. 6. When you are ready to assemble the cake, transfer the sponge onto a serving plate. Spread the ganache generously over the top of the ring. Crush the pretzels so they resemble twigs, then scatter over the ganache topping. 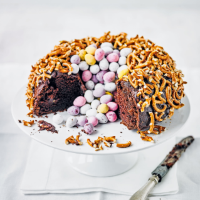 Fill the centre of the cake with mini eggs, then serve immediately. This recipe was first published in March 2018.